The Gellert’s daughter, Zoe, has faced CRPS head on. She has been inspired to do some great things. 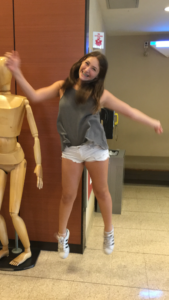 See what Zoe and the Gellert family are doing and what they learned about pediatric CRPS. “Dad! You need to come home. The doctor said nothing is broken or torn, but I still can’t put my foot on the floor. It feels like someone is sticking a knife through my heel and it’s burning inside”. These were the words of our 11-year-old daughter, Zoe Gellert, who the day before was involved in a crush injury to her right ankle. Zoe was immediately non-weight bearing and was describing pain symptoms that made no sense based on the findings from her X-rays and MRI. She was diagnosed with Complex Regional Pain Syndrome six weeks later. For my wife and I, this was the first moment in our lives that ‘brought us to our knees’. Having a child that is constantly in pain with symptoms that got worse over time was a devastating situation that immediately threw us into acute survival mode to obtain the best and most immediate treatment for our daughter. Zoe is very intelligent, passionate and determined – a born leader. Over the past nine months since her injury, Zoe has learned an incredible amount about herself and her disorder. Today, although Zoe is fully functional and playing sports, she continues to manage her daily pain with techniques that she has learned and that she is enthusiastic about sharing with other kids that are suffering. Zoe is committed to creating overall awareness about pediatric CRPS and to raising money to help fund vetted treatment and research projects and to help support parents seeking financial assistance for their child’s necessary treatments. Attached below is a detailed video of Zoe’s story that we would like to share. We hope that you enjoy it and that it is inspirational for you or someone that you know with CRPS. If you would like to email Zoe, please contact her at zoesheroes@icloud.com. We hope to hear from you! Conquering Your Childs Chronic Pain – Lonnie K. Zeltzer M.D. *We are parents, not doctors; hence, we are not making any representations or warranties regarding the above information which is based solely on the results of our own research and experiences. As you saw in the video, Zoe created a GoFundMe site. Please click on the link if you are able to make a tax-deductible donation and/or please share the GoFundMe site on your Facebook page or any other social media outlet. We thank you in advance for your support and for your donation. We also have an Instagram account – called “Zoesheroes” – that it would be super if you would “like” and follow us on our journey!